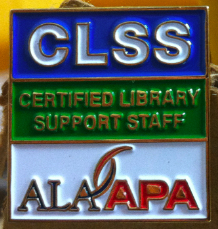 These library support staff members have successfully completed the Library Support Staff Certification (LSSC) Program and have been awarded the designation of Certified Library Support Staff (CLSS) by the American Library Association-Allied Professional Association. We congratulate you! Candidates hold their certification for four years, after which they must renew.